This article is about the Buddy Holly song. 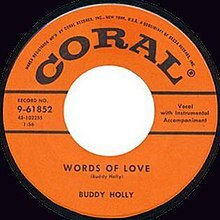 For the 1993 Buddy Holly compilation album, see Words of Love (album). For The Mamas and the Papas song, see Words of Love (The Mamas & the Papas song). For the O-Zone song known as "Words of Love" in English, see Dragostea Din Tei. (1957) "That'll Be the Day"
"Words of Love" is a song written by Buddy Holly. Holly recorded the song on April 8, 1957. Holly harmonized with himself, by combining tape recordings of each part. The song was not a notable hit for Holly, although it is regarded as one of his important recordings and is available in most standard Holly collections. A compilation album, Words of Love, released by PolyGram in the UK in 1993, reached number 1 and was certified as a gold record. A doo-wop version by the Diamonds, released by Mercury Records on May 20, 1957, reached number thirteen on the Billboard Hot 100 in July 1957. The Diamonds also performed the song live on the ABC television show Circus Time on June 27, 1957, and included it on the 1962 Mercury LP album Pop Hits (MGW 12178). The Beatles recorded a cover version of the song on October 18, 1964 for the UK album Beatles for Sale. It first appeared in the U.S. on the album Beatles VI. It was also on a 7-inch extended play, Beatles for Sale No. 2, released by Parlophone/EMI in 1965. John Lennon and Paul McCartney, who were fans of Holly, sang in harmony with George Harrison, holding to the vocal and instrumental sound of Holly's original as well as they could. Before their big break, the group had performed the song live between 1958 and 1962, with Lennon and Harrison singing. For the official release, though, Lennon and McCartney shared vocal duties. The song only took two takes, along with a vocal overdub. A 1963 performance of "Words of Love" recorded for BBC broadcast is included on the 2013 compilation album On Air – Live at the BBC Volume 2. The recording was also included on a five-song promotional EP from the album, and on a DVD or Blu-ray included with the 2015 album 1+. Jessica Lea Mayfield recorded a cover version of the song for the Starbucks compilation Sweetheart: Our Favorite Artists Sing Their Favorite Love Songs. Paul McCartney recorded a version in 1985 on acoustic guitar. His version was featured in the documentary The Real Buddy Holly Story. Pat DiNizio covered the song for his tribute CD, Pat DiNizio/Buddy Holly, in 2009. The power pop band Shoes covered the song for the 1989 Buddy Holly tribute album Everyday Is a Holly-Day. Jimmy Gilmer and the Fireballs released a recording of the song in 1964 on the album Buddy's Buddy. Mike Berry recorded the song in 1999 for the tribute album Buddy—A Life in Music, released on the Hallmark label. The Pete Best Band recorded the song in 1999. Jeremy Jay recorded the song in 2009. Patti Smith's cover of the song is featured on the 2011 release Rave on Buddy Holly, a tribute album featuring performances of Holly's music by various artists. Jeff Lynne contributed a cover version to the tribute album Listen to Me: Buddy Holly, released in 2011. ^ Song artist 320 – Buddy Holly. tsort.org. ^ Album artist 211 – Buddy Holly. tsort.org. ^ MacDonald, Ian (2005). Revolution in the Head: The Beatles' Records and the Sixties (2nd rev. ed.). London: Pimlico (Rand). pp. 140–141. ISBN 1-84413-828-3. ^ "Various - Sweetheart '09 (Our Favorite Artists Sing Their Favorite Love Songs)". Discogs. Retrieved 7 September 2017. ^ "Pat DiNizio/Buddy Holly - Pat DiNizio". AllMusic. Retrieved 7 September 2017. ^ "Various - Everyday is a Holly-Day". Discogs. Retrieved 7 September 2017. ^ "Jimmy Gilmer - Buddy's Buddy (Buddy Holly Songs by Jimmy Gilmer)". Discogs. Retrieved 7 September 2017. ^ Second Hand Songs: Words of Love. ^ "Rave on Buddy Holly - Various Artists". AllMusic. Retrieved 7 September 2017. ^ "Various - Listen to Me: Buddy Holly". Discogs. Retrieved 7 September 2017.